Orion is full of surprises and lots of stuff. These emission objects, Sh2-265, Sh2-263 and the reflection nebula VdB 38 lie in the constellation Orion right next to the bright 1.64 magnitude star Bellatrix, the 25th brightest star in the night sky. It's the star at the head of Orion. 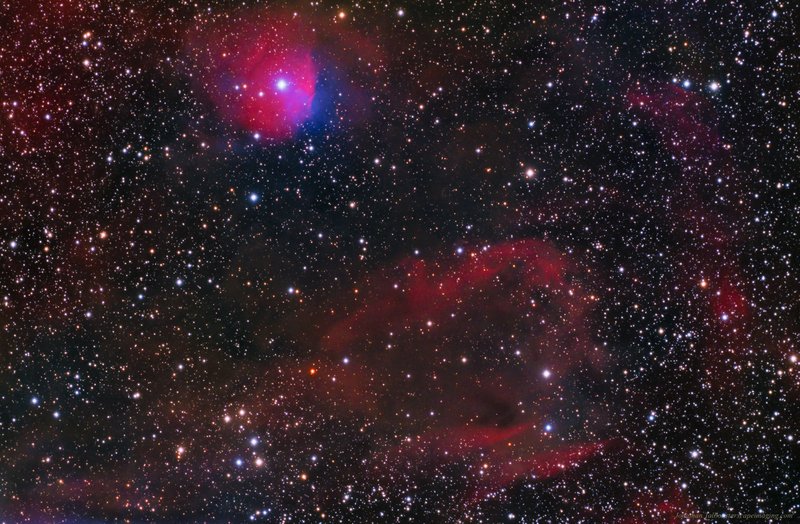 Sh2-263, also called the Raspberry Nebula is the bright red object in the upper left center of the image. From the bright star near the center of the nebula you can see wisps of blue reflection jutting out down and to the right. This is the reflection nebula VdB 30. Near the lower center of the image is the larger but fainter emission nebula cataloged as Sh2-265. Also an interesting object within the picture on the left side of Sh2-265 is the bright orange Carbon star HIP 25004. Carbon stars are typically red giants that have lost their hydrogen fuel and have gotten hot enough to fuse helium into carbon and oxygen. The carbon and oxygen tend to absorb blue light and only let red light reach our eyes so the star is bright red. Carbon stars tend to be nearing the end of their life cycle as they run out of fuel. The better see where these objects are check out this annotated image.